Julie Gassaway, MS, RN, has been a Health and Wellness Clinical Research Scientist at Shepherd Center in Atlanta since 2013. She heads Shepherd’s Spinal Cord Injury Peer Support Program funded by the Patient-Centered Outcomes Research Institute (PCORI) which focuses on innovative, patient-centered strategies to promote successful community re-entry following spinal cord injury rehabilitation. Gassaway has also developed an independent clinical research focus related to the long-term health and wellness of the former patients. An expert in medical research and rehabilitation, Julie spent more than two decades at the Institute for Clinical Outcomes Research, a division of the International Severity Information Systems (ISIS) in Salt Lake City, Utah. Most recently, she worked as the project manager for the Spinal Cord Injury Model Systems’ SCIRehab project funded by the National Institute of Disability Rehabilitation Research (NIDRR). Julie also served as the co-manager of the Pressure Ulcer Prevention in Spinal Cord Injury (SCI-SKIN) project funded by SCI Model Systems Center funds and project manager for the NIDRR funded Post-Stroke Rehabilitation Outcomes Project completed in 2005. What is a peer counselor? 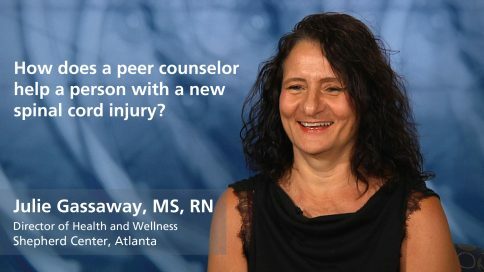 How does a peer counselor help a person with a new spinal cord injury? How are peer counselors matched with patients? When should peer counseling begin? Why do patients sometimes resist peer counseling? What is a peer-supported education program? What emotional support does peer counseling offer? What social support does peer counseling offer? How can peer counseling continue after someone is discharged? How do you go about finding a peer counselor on your own? How effective is peer counseling?